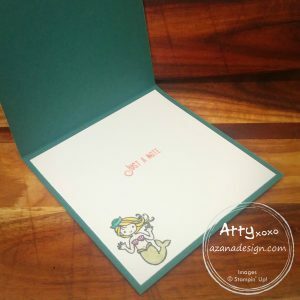 For my team swap for June, I CASE’d a card which was one of the display samples at the Toronto OnStage Local in April 2017, which I found via Pinterest. 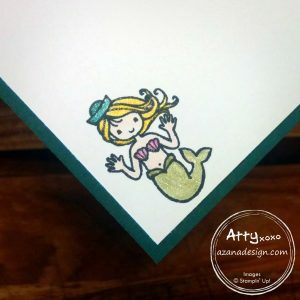 I used the new Message in a Bottle stamp set showing the whale and the mermaid. There are lots of cute little images in this stamp set, one of my other favourites is the little octopus – with his crazy little legs going everywhere. All the images are designed to fit inside the bottle, and I even love the little cork to seal the bottle. 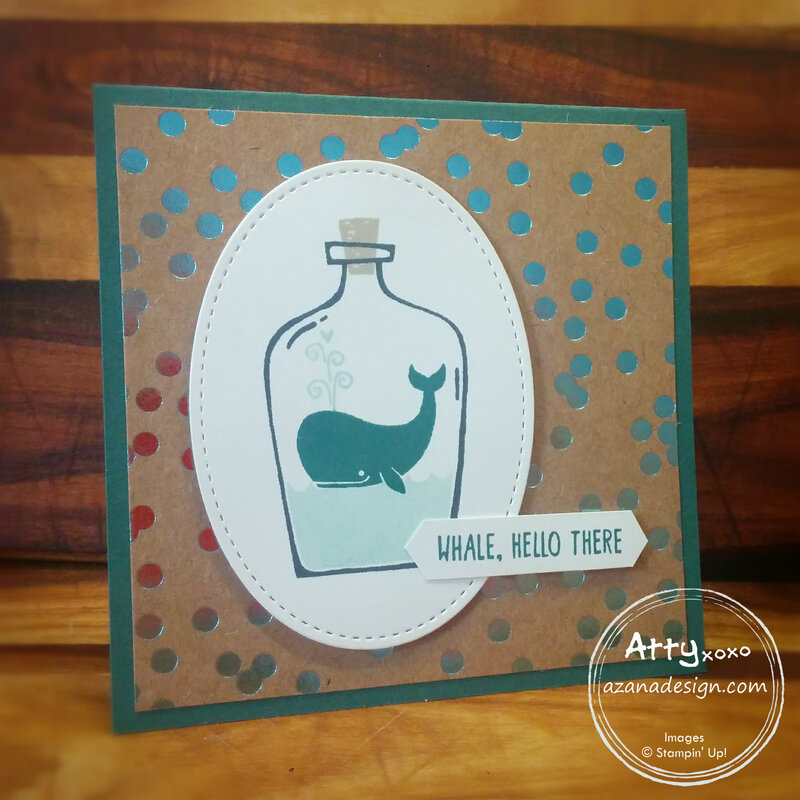 I’ve teamed the whale in a bottle with the new Foil Frenzy DSP – love this paper!! It’s so shiny. 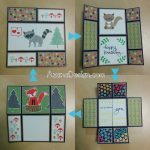 There are three different patterns in the pack – a scattered dotty pattern, a zig-zag chevron pattern and a striped pattern. Each pattern comes in four different colours – Berry Burst, Lemon Lime Twist, Soft Sky and Tangerine Tango. 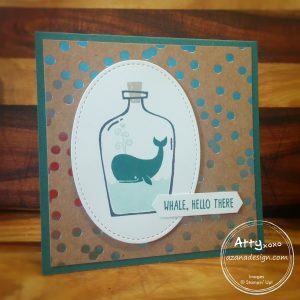 The whale in the bottle is stamped onto Whisper White cardstock, which I then cut out with one of the ovals from the Stitched Shapes Framelits. I placed the oval slightly off-centre to leave room for the sentiment: Whale, Hello There. The base cardstock, whale and sentiment are all Tranquil Tide – one of the new InColors. I didn’t get a chance to stamp the inside of the card for the swaps I did, as I was quite sick before the team meeting (and surprised I made it at all!). 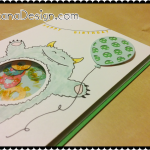 But afterwards when I was feeling better I got a chance to finish the inside of my sample card I had left over. I used the cute little mermaid since she looks like she’s waving hello. 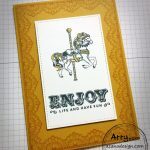 The sentiment is from the Lift Me Up stamp set – I used a Stampin’ Write Marker to only colour part of the sentiment as the full stamp says Just a note to lift your spirits which I shortened to Just a note. The mermaid was coloured using the Watercolor Pencils and to add some gorgeous shimmer I used the clear Wink of Stella over her hat, hair, shells and tail. The effect is hard to capture in a photo but it looks so good in real life. I posted this card to a friend as a bit of #happymail. I love receiving cards and letters (anything other than bills!) and it’s nice to share a bit of happiness with something as simple as a card.